Recent studies have indicated that, for the first time since 1950, intense geophysical activity is occurring at the Santorini volcano. The surface deformation associated with this activity was measured with the use of Envisat ASAR data and the application of two well-established Interferometric Synthetic Aperture Radar techniques, namely Persistent Scatterer Interferometry and Small BAseline Subset, producing dense line-of-sight (LOS) ground deformation maps depicting uplift with a radially decaying pattern in amplitude and velocity from the center of deformation. These can be seen in the figure at the end of the abstract, where the maximum inflation of ~150 mm/yr, an unprecedented magnitude for Santorini since quantitative monitoring of the area began, is observed at Nea Kameni (a resurgent dome within the caldera), and in Imerovigli and Fira in Thera island (northeast of Nea Kameni) - well known touristic destinations. 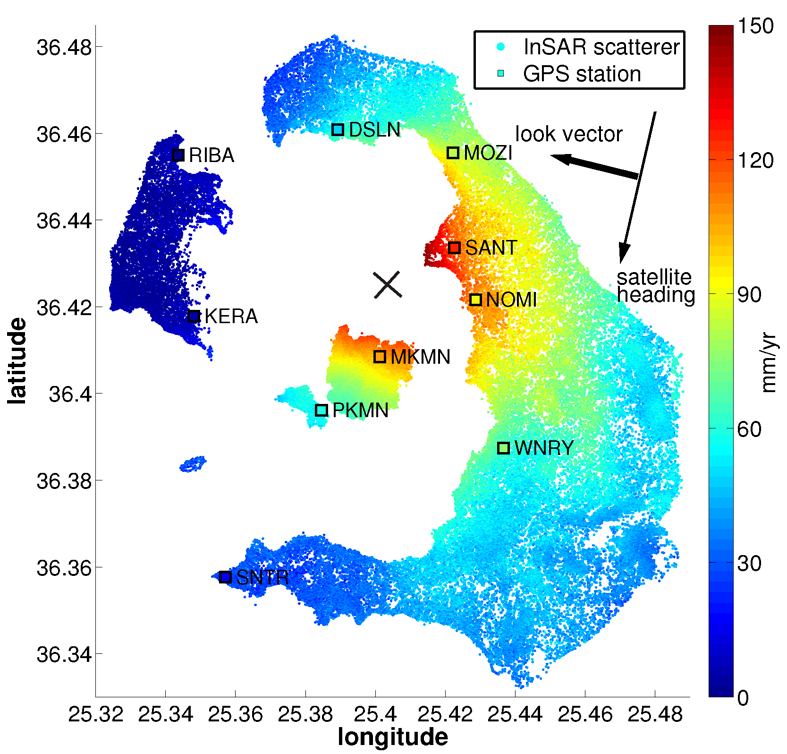 The displacement field estimated from InSAR interferometry was also compared with GPS observations from ten continuous sites installed and maintained on Santorini by various bodies, highlighting the same radial pattern outward from the center of the caldera. After the consolidation of the observations inferred from both GPS and InSAR, the deformation is modeled using a Mogi source located north of the Nea Kameni island, at a depth between 3.3 km and 6.3 km and with a volume change rate in the range of 12 million m3 to 24 million m3 per year. Hence, the depth of the source determined in this study suggests that this episode is likely to be one of magmatic inflation of the shallow chamber, since the corresponding volume is very small compared to the eruptive volume of past large eruptions, although it is comparable to smaller events in recent history. Additionally, the seamless monitoring of the volcano from the beginning of the rapid inflation episode, with InSAR, seismic and GPS data, suggest that the episode ceased since the end of February 2012. The observed displacement has declined significantly, reaching more than 80 mm/yr of velocity change in certain sites. These observations are possibly signaling a new phase of relative stability and reducing the probability of an imminent volcanic eruption, following empirical knowledge from calderas that experienced similar inflation episodes in the past. Finally, at the moment only TerrasSAR-X and Radarsat-2 are able to provide useful images that allow the remote sensing of the geophysical activity in the area, but access to these data is not straightforward. Therefore, the much anticipated Sentinel-1 mission is expected to provide valuable information for the systematic monitoring of the Santorini volcano.